In the mid-1800s, astronomers surveying the night sky in the Southern Hemisphere noticed something strange: Over the course of a few years, a previously inconspicuous star named Eta Carinae grew brighter and brighter, eventually outshining all other stars except Sirius, before fading again over the next decade, becoming too dim to be seen with the naked eye. What had happened to cause this outburst? Did 19th-century astronomers witness some strange type of supernova, a star ending its life in a cataclysmic explosion? The original goal of the team's observing program was to measure proper motions of stars and protostellar jets — fast streams of matter ejected by young stars during formation — in the Carina Nebula, but the same data also provided a powerful way to measure the motion of debris ejected by Eta Carinae itself. "Even though we still have not figured out the underlying physical mechanism that caused the 19th-century eruption, we now know that it isn’t a one-time event," Smith says. "That makes it harder to understand, but it is also a critical piece of the puzzle of how very massive stars die. 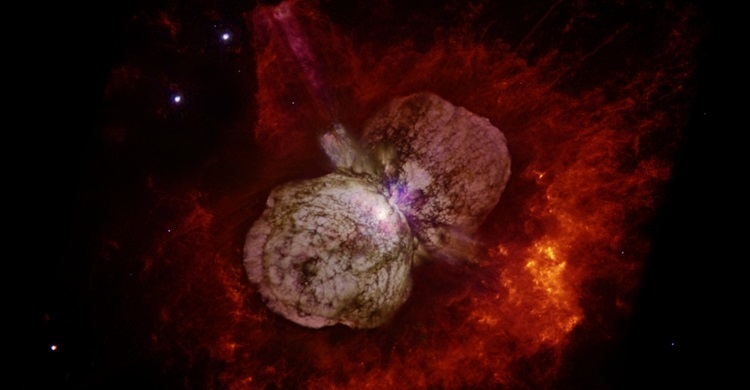 Stars like Eta Carinae apparently refuse to go quietly into the night."